The actions and response of West Berkshire Council and other organisations and companies to the recent flooding and storm events. The review should include the response by the council itself, the Environment Agency, the emergency services, the armed forces, and by Thames Water and other utility companies. The review should include all actions in response to the floods and storms. It should also recommend actions to all these organisations to prevent the events happening again or to minimise their impact. Many communities in West Berkshire have been badly affected by flooding and storm damage in the last couple of months. Some villages and towns have been badly affected by river flooding from the Thames, Kennet or other rivers. Others have been flooded by rising groundwater or sewage. At the same time storm force winds have brought down trees and power lines, blocking roads and causing power cuts. Council officers and staff, neighbourhood wardens, police and fire officers, armed forces, agency staff and utility company employees have all been working exceptionally hard for extremely long hours. However lessons can be learned for all the organisations involved. Lessons should be learned from the actions of the Council and other organisations involved. Actions should be proposed that either prevent the flooding and storm events happening again or minimise their impact. 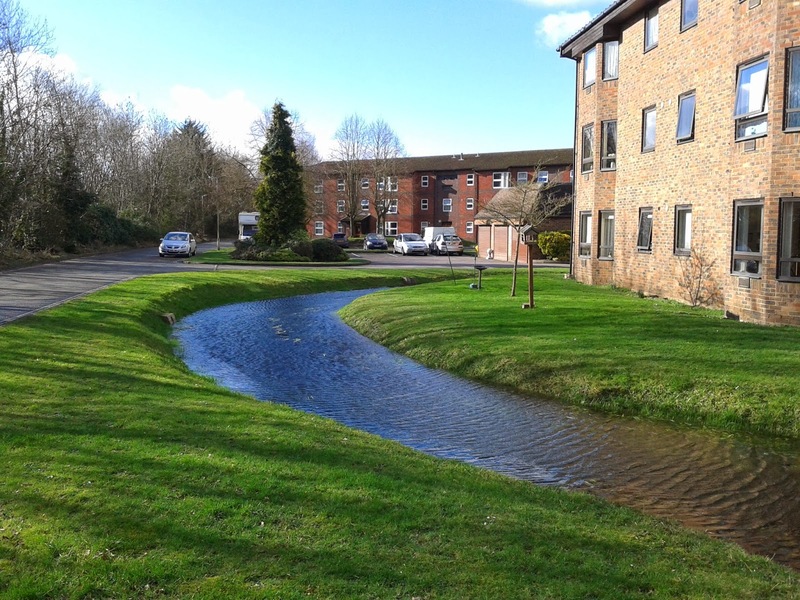 After a heavy shower yesterday I noticed that a lot of water was running down the gutter on the south side of The Green and then down the opening between the Rockley Court and Stoneleigh Court flats. I investigated and found that all the gullies (drains) on this side of The Green between Horseman's garage and the roundabout appeared to be blocked. I have reported this to West Berkshire Council who have undertaken to "cleanse" the gullies. I drove along Hangar Road all the way from Theale to Sheffield Bottom yesterday. The eastern side of the road was dry, though there was still water on the western side. There was a “road closed ahead” sign on Station Road, at its junction with arrowhead Road, and a “road closed” sign at the Sheffield Bottom end. I have asked West Berks Council to officially re-open the road. The sewage was running into the watercourse that surrounds two sides of the building, leading to pollution. I strongly suspect that the flooding has ceased because Thames Water's contractors cleared a blockage in the sewer running under the High Street yesterday. Thames Water had previously blamed groundwater filling the sewer and overloading the pumping stations. Thames Water had promised me that they would clear the site of sewage detritus once the flooding has ceased. They had not yet done that when I checked this evening. I will check again tomorrow and chase them if it still has not been done. I checked this afternoon to find that Southern Housing Group staff were making a very good job of clearing up. They were happy to clear up and didn't want me to get Thames Water down to do the job. They had opened up the two manholes. The one that had been leaking sewage was empty and its sewer had a good flow. The one into which the leaking sewage had been diverted turned out to be for another sewer and not for a surface water drain. Fortunately, therefore, I need not have worried about pollution. I noticed that sewage from a damaged manhole cover was flooding a turning head in Spring Gardens. I have reported the flooding and the manhole cover to Thames Water and to West Berkshire Council. I also reported the flooding of Deadmans Lane at its junction with Spring Gardens to the council. I'm not sure whether that's surface water or groundwater flooding, or a combination of the two. 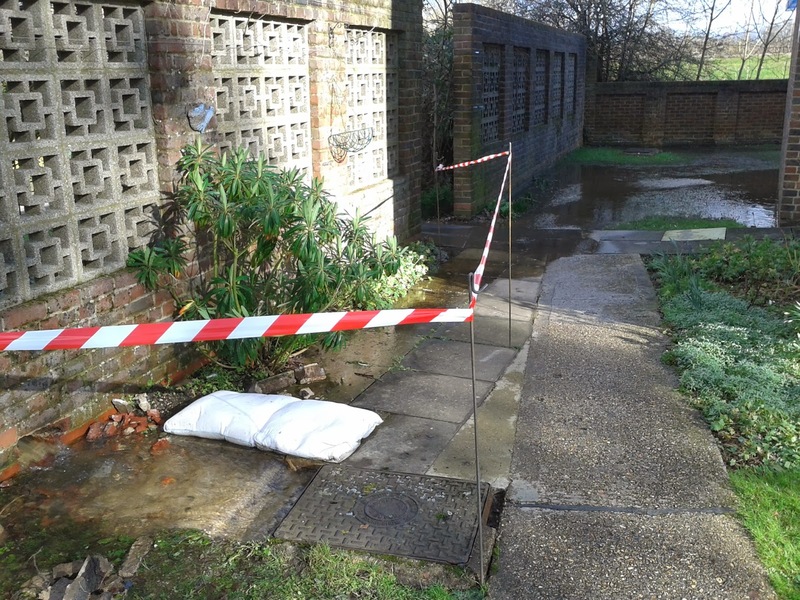 If you experience or see sewage flooding, then please report it to Thames Water on 0845 920 0888. They will probably not be able to solve the problem (the local sewage system is being inundated with groundwater), but they are required by law to record all sewage flooding incidents. Please also let me know about them by email,Twitter or Facebook so that I can get them logged at the council. Groundwater and sewage flooding is likely to continue for months, according to The Times. 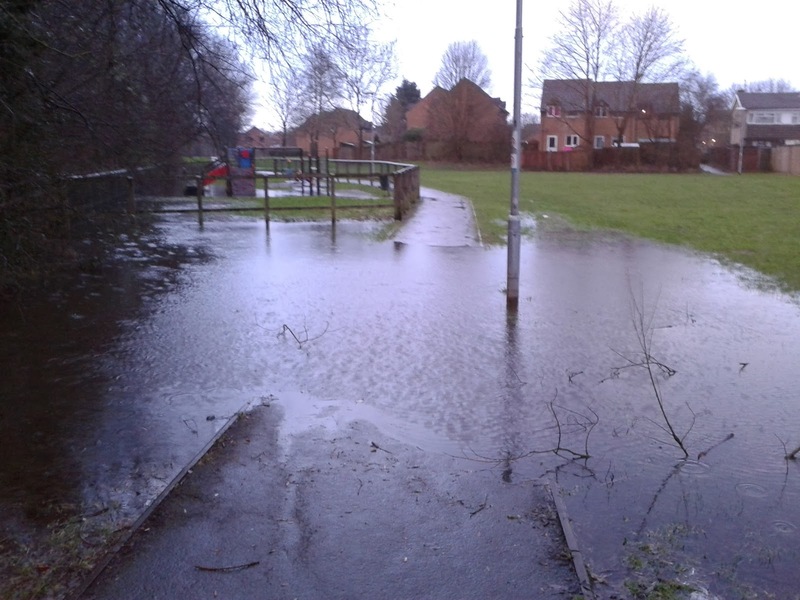 We are experiencing various degrees of sewage flooding in most areas of Theale. All the sewage pumping stations in Theale are overloaded. Thames Water say that they cannot do anything about it until the amount of groundwater going into the sewers is much reduced. They have tried pumping the sewers out into tankers, but the sewers fill up as quickly as they are pumped out. Flushing the toilet only when absolutely necessary. Only put washing machines and dishwashers on when you have a full load. Try to put washing machines and dishwashers on late at night when loads on the sewer system are at their lowest. If you experience sewage flooding, then please report it to Thames Water on 0845 920 0888. They have a legal obligation to report all instances. I believe that the manhole that the effluent is running into feeds into the watercourse that runs around the building (see below). I called Thames Water and found out that, although they had dealt with a problem there on Tuesday (February 4th), they were not aware of this latest problem. They promised to send someone out urgently to deal with it. This was one of the three sewage problems I reported to Thames Water today. It is also very high where it runs close to Leonard Court. The watercourse flows into a balancing pond at the junction of Hoad Way and the bypass. Water should then flow out of the balancing pond through a culvert under the bypass and then through another culvert under Waterside Drive. I investigated the culverts and found that there was no water flowing out of them. 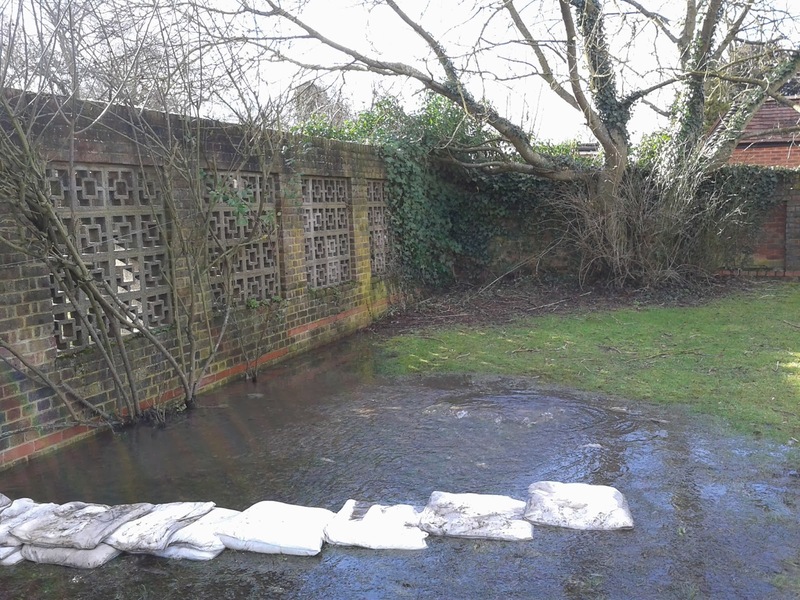 I therefore reported the suspected blocked culverts to West Berkshire Council. West Berkshire Council has started on work to produce a new Minerals and Waste Plan. They have gone out to consultation on an “Issues and Options” document. Some of the options in the document are about the future of the minerals depots in Wigmore Lane. for more capacity for importing minerals from outside West Berkshire? permission for new mineral uses, subject to meeting defined planning and environmental criteria? the rail connected coated roadstone plant should be safeguarded from other forms of development. This would allow the existing patterns of construction aggregate importation to continue? The document and a response form can be accessed at the following webpage. The relevant section starts on page 70. I will be making a response, however it would be best if you respond to the document yourself. I would also welcome your input for my own response. The consultation finishes on 28th February. A Planning Application has been submitted to West Berkshire Council for eight detached houses to be built on the land between the the end of St Ives Close and the lake. Please click here to view the plans and make comments. The plans can also be viewed at Theale Parish Council's offices in the Recreation Ground, Englefield Road between 10 am and 2 pm Monday to Friday. Comments can also be sent by post to the Chief Planning Officer, West Berkshire Council, Market Street, Newbury, RG14 5LD, or by email to planapps@westberks.gov.uk, quoting application number 14/00034/OUTD. 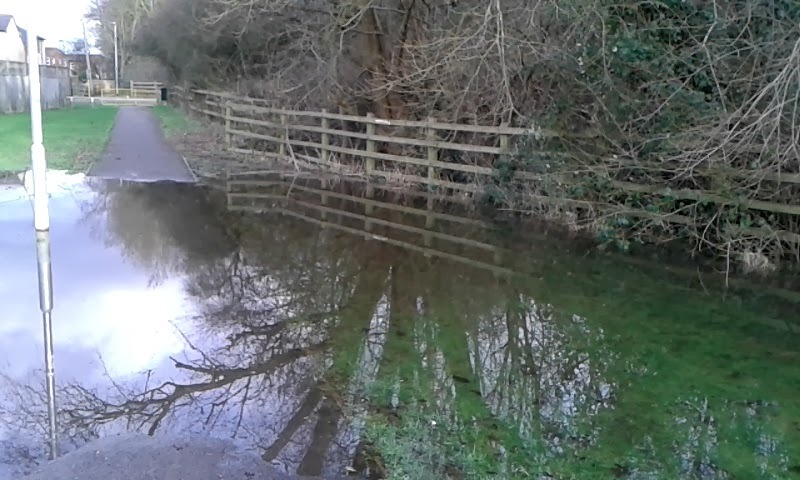 Please stay out of the flooded area at the Station Road end of the green space between Meadow Way and the Theale bypass. The flooding is caused by sewage overflowing from a manhole. I saw a teenager and a mother and tree children "paddling" through it yesterday, despite my warnings. I chased Thames Water today to see what action they are taking to solve the problem. The problem is caused by groundwater leaking into the sewers and over-loading the sewage pumping stations. 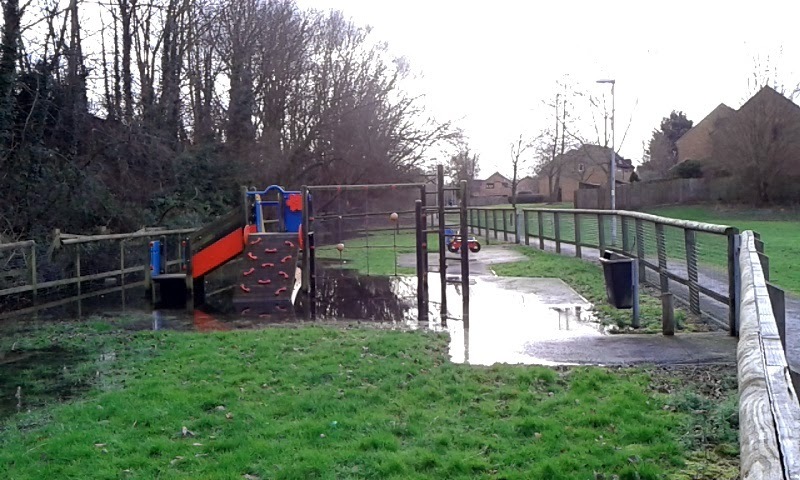 Reported this flooding affecting the green area and play area between Meadow Way and the bypass to West Berkshire Council and Thames Water. The flooding is caused by an overflowing manhole and made worse by a blocked culvert stopping the water draining away. Please don't wade through this water as it may be sewage! 6 reported potholes. Some reports covered dozens of potholes in the same stretch of road. 7 covered streetlights, 6 not working and one staying on during the day. One reported the floodlight not working in the main car park. Others covered flytipping, highways flooding and obstructed watercourses.